Liquidambar (Liquidambar styraciflua): growing, planting, caring. Liquidambar, also known as the American Copalme, is a beautiful pyramidal tree with splendid autumn colors, often used in the garden. It is very rustic and requires little maintenance. Liquidambars are exceptionally beautiful in the autumn. They are large, deciduous trees, 25–40 metres (82–131 ft) tall, with palmately 3- to 7-lobed leaves arranged spirally on the stems with a pleasant aroma when crushed. In autumn they turn to purple or deep red - depending on the sunshine and the nature of the soil. Their fruit in the shape of small spiny spheres makes them easy to identify. 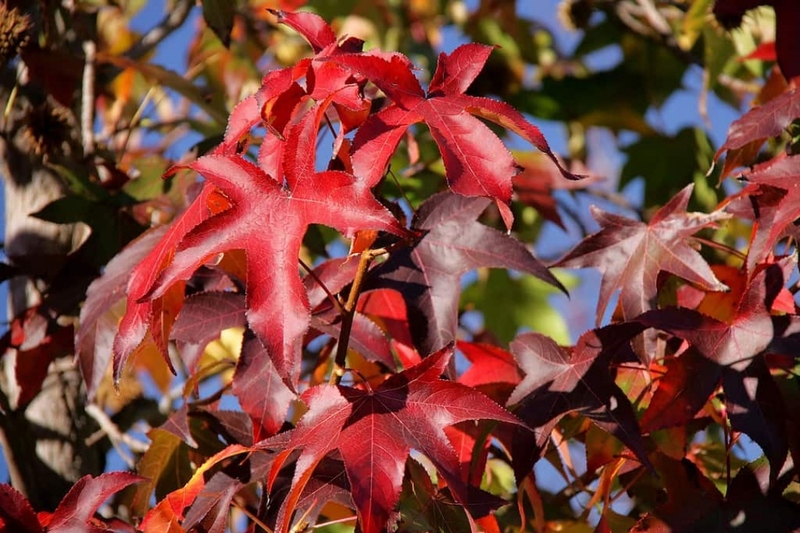 Plant your sweetgum in deep acid or neutral soil, drained and cool in the summer. They need a lot of light. Plant preferably in winter, in bare roots or in mound. Dig a hole deep enough, twice as large as the root ball, without mixing the layers of the soil. Plant a solid stake at the bottom of the hole, on the edge, inclined to the prevailing winds. Cut the root hair - the fine roots that looks like hair - to balance the volume of roots and foliage. Plant without burying the boundary between trunk and roots of the tree, putting the soil layers in the same order you removed them. Tamp the soil around the roots with your foot, so you do not leave a pocket of air, and attach the stake to the trunk with a suitable extensible link. Form a hollow in the soil and water abundantly until you fill it. Water regularly and generously for several weeks after planting or sowing, especially if you did it late in the season. After, no need to worry about it, except maybe in case of drought. Your tree should be well rooted after two or three years, so remove the stake now that it is not needed anymore. You will help greatly your sweetgum by placing on its base a layer of mulching that will keep it cool. Renew it in April and November if needed.